3.4.4.10 Any government in the state of Washington may extinguish debt prior to the debt maturity date. The refunding is authorized by Chapter 39.53 RCW also known as the Refunding Bond Act. 3.4.4.20 An advance refunding occurs when previously issued debt is retired as it matures or at a call date at least in part by a new debt issue. Usually refunding is done to take advantage of lower interest rates or to modify debt service requirements. Often the proceeds from the sale of new debt with a lower interest rate are used to pay off old debt with a higher interest rate. 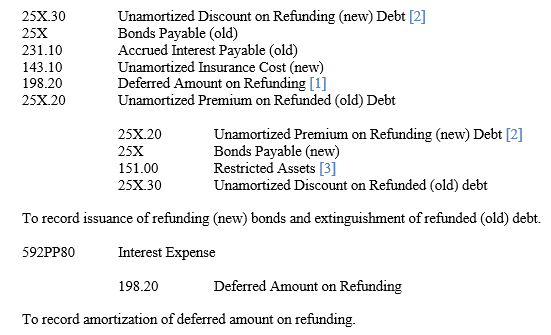 Refunding is financially worthwhile when the present value of the savings from lower interest rates on the refunding debt plus any income from the investment of the refunding debt proceeds pending redemption of debt to be refunded are greater than the present value of the fees, sales discounts, redemption premiums and other costs of refunding. 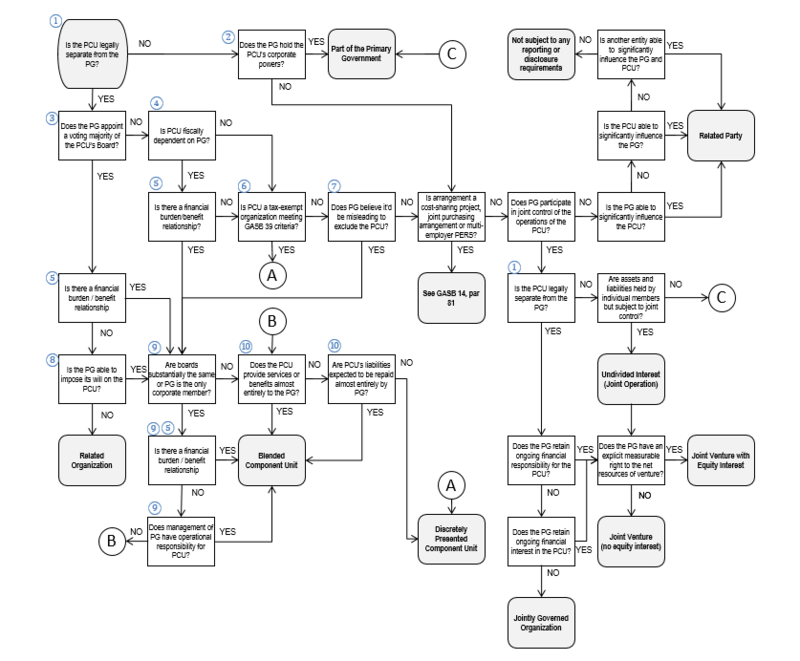 3.4.4.30 There are two ways to structure the advance refunding of debt: the regular method and the crossover method. Refunding debt (sometimes referred to as new debt) - debt issued to provide funds to replace the refunded debt at specified dates. Refunded debt (sometimes referred to as old debt) - debt for which payment at specified dates has been provided by the issuance of refunding debt. 3.4.4.40 Under the regular method of advance refunding there can be either a legal or an in-substance defeasance. 3.4.4.50 A legal defeasance occurs when debt is legally satisfied based on certain provisions in the debt instrument, even though the debt is not actually paid. A legal defeasance is rare in the government environment and generally occurs only when an amount sufficient to pay both principal and interest at the time of deposit is placed in an irrevocable trust with an independent escrow agent. A government is released from its legal status as the primary obligor on outstanding indebtedness after an escrow account is established (the government is only contingently liable). 3.4.4.60 In an in-substance defeasance debt is considered to be extinguished for financial reporting purposes even though a government has not met the legal requirements for a defeasance and so legally remains the primary obligor on the indebtedness. The proceeds from the sale of refunding (new) debt together with any other funds the entity may set aside for payment of refunded debt must be irrevocably placed with an escrow agent in a trust. The escrow agent invests the proceeds so that the cash realized from the maturing investments together with interest earned will meet the debt service requirements of the refunded (old) debt and redeem the balance of the old debt when it becomes callable or matures. Cash or other assets used for refunding must qualify as “essentially risk-free as to amount, timing and collection of principal and interest” and they must provide cash flows that are sufficient and timed to match the scheduled interest and principal payments on the debt that is being extinguished. Also, the chance of the government being required to make any additional future payments must be remote. 3.4.4.70 Generally, the requirement for “essentially risk-free” securities may be accomplished through the purchase of U.S. government securities, securities guaranteed by the U.S. government, or U.S. government backed securities. 3.4.4.80 The government does not budget or report any refunded (old) debt. However, the government is responsible for verifying the amounts reported by the trustee. 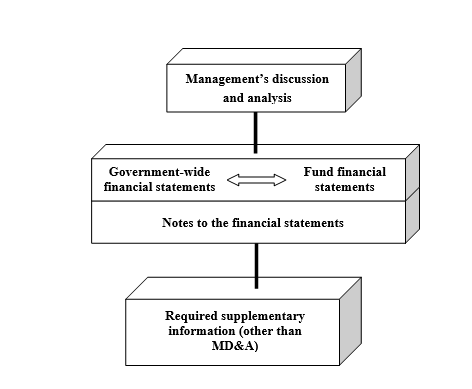 The amount of the old debt should be disclosed in a note to financial statements. 3.4.4.90 Since governmental funds operating statements reflect only the financial resource flows related to the refunding transaction, they do not report a gain or loss on an advance refunding resulting in defeasance. 3.4.4.91 Per GASB Statement 86, Certain Debt Extinguishment Issues, payments to the escrow agent made from the existing resources should be reported as debt service expenditures in financial statements using the current financial resources measurement focus. 3.4.4.100 The provisions of the Refunding Bond Act (Chapter 39.53 RCW) satisfy the criteria for in-substance defeasance, except for the requirement to place cash and assets in an irrevocable escrow. If the irrevocable trust fund is not established, both the refunded (old) and the refunding (new) debt must be recorded and reported in the government’s financial statements. The refunded (old) debt is no longer reported on the government-wide statement of net position. The unmatured refunding (new) debt is reported on the government-wide statement of net position and the debt service on the new debt is recorded, budgeted and reported in the debt service fund. Because governmental funds focus only on current financial resources, they do not report long-term debt principal in the funds. It is reported in the government-wide statement of net position. 1. Reacquisition price is the amount required to repay previously issued debt in a refunding transaction. In a current refunding, this includes principal of the old debt and any call premium. In an advance refunding, it is the amount placed in the escrow account that, together with interest earnings, is necessary to pay interest and principal on the old debt and any call premium. A premium or discount pertaining to the new debt is not considered part of the reacquisition price, but, instead, is a separate item related to and amortized over the life of the new debt. 2. Net carrying amount is the amount due at maturity, adjusted for any unamortized premium or discount related to the old debt, as well as any deferred outflows of resources or deferred inflows of resources associated with a derivative instrument that is an effective hedge of the old debt and remaining prepaid insurance related to extinguished debt (GASB Statement 86, Certain Debt Extinguishment Issues). The difference between the reacquisition price and the net carrying amount of the old debt should be reported as a deferred outflow of resources or a deferred inflow of resources and recognized as a component of interest expense in a systematic and rational manner over the remaining life of the old debt or the life of the new debt, whichever is shorter. Use either account depending if the refunding (new) debt was issued at premium or discount. Use this entry if there are funds available in various restricted assets accounts for payment of refunded (old) debt. 3.4.4.130 In this type of refunding the proceeds from issuance of refunding (new) debt are placed in the escrow account. 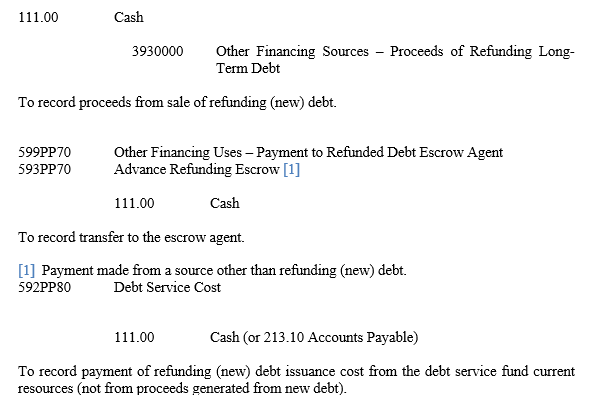 The escrow account does not immediately make payments on the refunded (old) debt principal and interest. Instead, it pays all or a portion of the refunding (new) debt’s principal and interest until a crossover date when the refunded (old) debt can be called or it matures and the amount accumulated in escrow is sufficient to repay it. 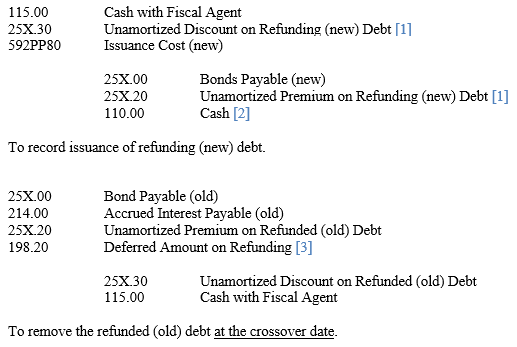 Until the crossover date, both the refunded (old) and refunding (new) debt would be reported in the financial statements. 3.4.4.140 Until the crossover date, the debt service on the refunded (old) debt is recorded and budgeted in the debt service fund. Assets held in the trust by the escrow agent to pay debt service on the refunding (new) debt are also recorded in the debt service fund. Both the refunded (old) and refunding (new) debt are reported on the statement of net position, pending the crossover date. The new debt is not to be included in the computation of indebtedness for the purpose of any constitutional or statutory debt limit. Transfer of resources other than proceeds of the refunding debt (e.g., excess of cash available for the refunding transaction). See journal entry for the defeasance method for description of this account.